The quantum world is both elegant and mysterious. It is a sphere of existence where the laws of physics experienced in everyday life are broken—particles can exist in two places at once, they can react to each other over vast distances, and they themselves seem confused over whether they are particles or waves. For those not involved in the field, this world may seem trifling, but recently, researchers from the Okinawa Institute of Science and Technology Graduate University (OIST) have theoretically described two quantum states that are extraordinary in both the physics that define them and their visual appeal: a complex quantum system that simulates classical physics and a spellbinding necklace-like state. Their study is published in the journal Physical Review A. The quest for these states begins with a doughnut, or rather, a doughnut-shaped container housing a rotating superfluid. This superfluid, which is a fluid that moves with no friction, is made of Bose-Einstein condensates (BECs) comprising particles with no charge that are cooled to near-zero degrees kelvin, a temperature so cold, that it does not exist in the universe outside of laboratories. At this temperature, particles begin to exhibit strange properties—they clump together, and eventually become indistinguishable from one another. In effect, they become a single entity and thus move as one. Since this whirling BEC superfluid is operating at a quantum scale, where tiny distances and low temperatures reign, the physical characteristics of its rotation are not those seen in the classical world. Consider a father who is swinging his daughter around in a circle by the arms. Classical physics mandates that the child’s legs will move faster than her hands around the circle, since her legs must travel further to make a complete turn. In the world of quantum physics the relationship is the opposite. “In a superfluid…things which are very far away [from the center] move really slowly, whereas things [that] are close to the center move very fast,” explains OIST Professor Thomas Busch, one of the researchers involved in the study. This is what is happening in the superfluid doughnut. In addition, the superfluid inside of the doughnut shows a uniform density profile, meaning that it is distributed around the doughnut evenly. This would be the same for most liquids that are rotating via classical or quantum rules. But what happens if another type of BEC is added, one that is made from a different atomic species and that cannot mix with the original BEC? Like oil and water, the two components will separate in a way that minimizes the area in which they are touching and form two semicircles on opposite sides of the doughnut container. In a rotating superfluid with two components that are miscible, or mixable, the matter will be distributed evenly within the doughnut-shaped container. This is the same density profile seen in a rotating, single-component superfluid. When the two components are immiscible, or not mixable, they will separate from each other and form two semicircle clumps on opposite sides. “The shortest boundary [between the components] is in the radial direction,” Dr. Angela White, first author on the study, explains. The two components separate into different halves of the doughnut along this boundary, which is created by passing through the doughnut’s radius. In this configuration, they will use less energy to remain separated than they would via any other. 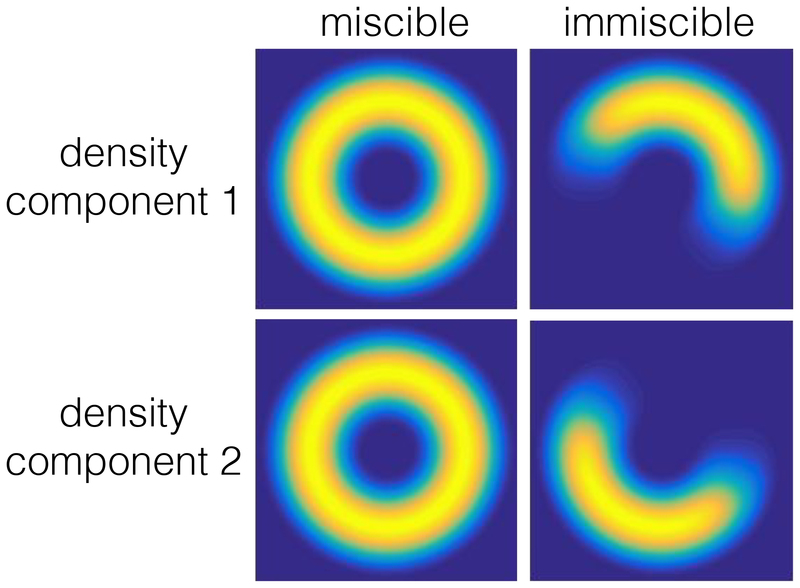 In the immiscible, or unmixable, configuration shown in Figure 1, the quantum world surprises. Since the boundary between the two superfluids must remain aligned along the radial direction, the superfluid present at this boundary must rotate like a classical object. This happens in order to maintain that low-energy state. If at the boundary the superfluids continued to rotate faster on the inside, then the two semicircles would start to twist, elongating the line that separates them, and thus requiring more energy to stay separated. The result is a sort of classical physics mimicry, where the system appears to jump into the classical realm, facilitated by complex quantum mechanical behavior. At this stage, the superfluid doughnut has reached its first extraordinary state which is one that mimics classical rotation. But there is one more step needed to transform this already mind-boggling system into the necklace end-goal: spin-orbit coupling. “In a very abstract way, [spin is] just a thing that has two possible states,” Busch explains. “It can be this way or it can be that way.” For this experiment, which involves particles that have no charge, or no spin, the researchers “faked” a spin by assigning a “this or that” property to their particles. When coupling the particles based on this property, the two semicircles inside of the doughnut break into multiple alternating parts, thus forming the necklace configuration (Figure 2). By digging further into its composition, the researchers found that the number of “pearls” in the necklace depends on the strength of the spin-orbit coupling and, more surprisingly, that there must always be an odd number of these pearls. The number of pearls in the quantum necklace depends on the strength of the spin-orbit coupling. A stronger coupling produces more pearls, and the number must always be odd. Researchers have predicted quantum necklaces before, but they were known to be unstable—expanding or dissipating themselves to oblivion only a short time after being created. In this theoretical model, the OIST researchers believe they have found a way to create a stable necklace, one that would allow for more time to study it and appreciate its refined majesty.